If you’re hookah smoker for a while, you certainly heard about Khalil Mamoon, but do you know why KM stand OUT from other brands? Whether you heard about KM or not, after reading this article you will find everything about these artworks as well as the 5 best Khalil Mamoon hookahs that you can find on the market. We’ve already written about KM in our Hookah guide for beginners have we mentioned these hookahs as one of the good nargiles for someone who just started out. Also, we talk about this brand in our Top-rated hookah brands guide. You can check both of these articles if you want, but here we’ll go in deep. This is the complete Khalil Mamoon hookahs review, we’ll try to explain everything that you’ll ever need to know if you decide to buy this magnificent brand. What Are The Best Khalil Mamoon Hookahs in 2018? To give you a clear picture, here are the top 5 Khalil Mamoon hookahs, list, and review, that perfectly represents these qualities. This splendid offering from the Khalil Mamoon company doesn’t seem to have any shortcomings that go with it. The 34″ height is the best thing about this unit- making it ideal for everyone to enjoy themselves under this heap of beauty. It can sit like a piece of art in your living room or the venue you wish to use it. The Egyptian tradition is accentuated by the single nargile hose- which comes down like a droplet in a waterfall at one side. This is for every professional smoker- or anyone looking to add a bit of an edge to their smoking adventure. The smoke gets iced to bring a cool refreshing breeze when you pull through the unit- this is all compliments of the ice chamber at the head of the hookah. The stem is middle-grade steel, making it strong enough to support this work of art while it is upright in your area. You should be caught with this in your possession at a festival or party of your liking. It is very easy to maintain once you have finished enjoying the vast benefits it brings. The steel just requires little effort in keeping in mint condition. It features an easy to use a brush set to maintain its perfect sparkle. This is not a letdown in terms of height. Towering a very tall 33′ in height, this is ideal for supplying you with a perfect smoke fest that won’t cause you any discomfort when you use it. It is instilled in Egyptian culture all over it. The hoses are perfect for an effective draw that lets you take in every bit of the contents you are inhaling fully. It boasts an Authentic chiller that enhances the feel by transforming the smoke into the chilled air to bring a different experience to your senses, stimulating a whole new area of your palate. Not a shred of reputation is lost in this piece, with the utmost value packaged in the mammoth, yet compact work of art. There is an unavoidable aura of Egyptian tradition that surrounds this pipe. The stem is a symbol of strength, showing durability that can even be detected from just a glance at the hardened metal- that has been put through the test of strength. This is perfect for use in outdoor venues- you won’t have a care in the world of it breaking while you are using it. The steel is not the only value you get here, you get a well-cut foil made of black diamond. In addition to that, a box of charcoal is generously added to make sure you enjoy longer smoking sessions without worry. There is an immense number of 72 pieces that are in the package. Equipped with everything you need to be a world-class level when it comes to hookah smoking. The kit is a bargain in the hookah industry. There is an inclusion of a charcoal burner that helps you to take full advantage of all these benefits. Yet another array of convenience for your smoking pleasure. This is the first all-black colored unit by the Egyptian manufacturers. This doesn’t rob it of the companies trademark of hand-made smoking pieces. A bit heavy when it comes to mass, this is optimal in making sure that it is really hard to tip over once it is placed on the ground. This is also the characteristic that influences the high-quality steel used in the making of this mountain of benefits. Nothing can overshadow this 34“ tall smoking tool. The unit delivers on every aspect- from its stainless tell finish that provides high caliber durability. A single hose that is perfect for natural feeling draws, this also comes with a large bore to ensure maximum results for you beyond satisfactory. The plate is in all black too, you will be finishing bowls before you can even finish unwrapping this. The set includes a wide array of tools of the hookah trade. The intent here was to blow you away. This is without a doubt best Khalil Mamoon hookah with multiple hoses. 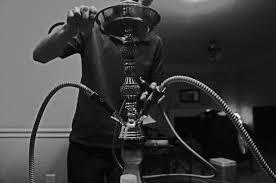 But also the best traditional hookahs with more hoses. Made of gold and copper throughout the design, this is a spectacular device that could qualify as modern art. The heaviness in the pipe is owed to the metal that is used to make it- this is still kept traditional with handmade craftsmanship. This combination of three key metals give it it’s heavyweight, offering high-quality strength and durability. It caters to occasions where you have large groups to part-take in a relaxing smoke with. It is complemented by a multi-hose capability to make sure everyone gets a chance to smoke to their fill. The number of hoses you can fit here is an astonishing figure, allowing up to four hoses in the ports that run through the stem. These are all traditional nargile hoses that come with the delightful device. If you are not in the company of many people, or you just want an intimate smoking session- you need not worry. There is an option to adjust the hose capability to fit your preferred number. You can take the number of hoses from four, three, two and one hose respectively at will. This is a great customization capability offered by the manufacturer. What is The Kahlil Mamoon? Khalil Mamoon is the name of the founder of the wonderful hookah pipe company that supplies the world with the delightful unit. He has come a long way with supplying the Egyptian industry with the products that smokers around the world enjoy. His experience in the antique restoration is translated in the hookah designs we all know and enjoy. This is a company with decades of experience under their belt in hookah making. They have been able to keep the Egyptian tradition alive for an impressive 50 years and still counting. The company is a family legacy and is currently being run effectively by the third generation since its establishment. These products are made with the utmost love and care- they are not just made in a factory with machinery to distribute to people. They are handmade by the company’ loyal and experienced workers to give it a personal feel and maintain the Egyptian entails when you use it. They make sure to oversee every aspect of the procedure to produce these hookah pipes, from the initial phase of manufacturing- to when they package and ship the final product to USA- which they do themselves. What To Consider When You Buy A Khalil Mamoon Hookah? There are a lot of things to take into consideration when you decide to choose the best Khalil Mamoon hookah for you. Showing up to the hookah store in person to inspect the unit is a really good initiative to ensure your satisfaction. When you are there in person it can give you the perfect idea of how your smoking conquests are going to be like. Most of the stores also sell an assortment of flavors that are not listed anywhere else- If you take the time to negotiate- you can walk out of the store with a special price on other material to go along with the unit. Gaining your convenience and saving you time. There is also the option that you can order your set online. If you are getting it from a supplier that you can trust. The collection comes with a very supportive height capability for all their units. With sizes starting from 30“ all the way to 40“ on average. Make sure to pick the Mamoon hookah that is supportive of your height so that you don’t have to crouch when you are standing or sitting awkwardly to get the right angle. The hookahs are made with a stainless steel finish- from the stem to the rings just under the tray. The number of hoses KM supports is from one person to a group of people Units usually accommodate one hose. With others supporting two or more hoses are ideal for a group setting due to the hookahs multi-hose function. The design of the hose capability is also what you should consider. Sometimes a unit has a multiple hose set up, which allows you to connect many hoses separately from the stem. Hose inspection is done by connecting each hose individually to the hose port and blowing air through it to check for a leak- you should do so in a quiet environment that allows you to listen clearly You won’t be disappointed with the KM. Size of the vase doesn’t play too much of a role when it comes to smoking. What you should pay attention to is the condition of the vase. It has a ball bearing when you unscrew the valve, that connects it to the stem- detaching it from the rest of the unit. It is not cracked or showing signs of being prone to a leak when it is shipped. Just hand painted to add to the beauty of this unit. You should ask your supplier to fill it with water to check if it was damaged on shipping. This alone can save you a lot of frustration once you have it sorted. Getting the hookah unit at the right price is a multifaceted consideration. Experience and popular belief have it, the more that you spend on a Mamoon hookah, the better the quality. Khalil Mamoon Egyptian hookahs provide are so responsible, even If the price is low, you are still getting a hookah that will not compromise your smoking experience. You are getting a real bargain when you take into consideration, the Khalil hookas quality in the convenient height, make, hose type and beautiful vase when you pay for this. A KM hookah that has them all is worth every cent. How to Spot Fake Khalil Mamoon? The initials on the Mamoon hookah should be stamped on the upper part of the stem, the metal tray, and the hoses. With increasing demand and people looking to cash in on this market, these have become very easy to fake. With the fraudsters packaging involving spelling errors that are easy to notice, these usually have an extra alphabet or are missing one. If a hookah doesn’t have the name Khalil Mamoon spelled right- there is a high probability that it’s a fraud. But, the manufacturers do tend to get it spelled wrong now and then. Besides the initials that are on the hookah, the physical structure can be observed to spot a real unit during an inspection. The Mamoon hookah is solely made of stainless steel- with an exception of Khalil Mamoon Basha Four Hose 34” that has steel, copper, and gold as it’s choice of metal. It is unbreakable! The steel is thick throughout the design. Making it perfect for optimal durability. The marks that are on the unit are the most prominent signs that you are holding an authentic Mamoon Hookah. These are the weld marks that are a byproduct of how the piece is manufactured. This is in accordance with the rich Egyptian tradition that insists on handmade craftsmanship. You can notice these along with the scuffs that run along the length of the stem of the pipe- or by the unpolished appearance on some pipes. This is what sets them apart from other hookahs. They are only made in Cairo- a city in Egypt. The glass vase is also an indicator of an authentic hookah, you will observe that it was painted by hand. What is so Special About Khalil Mamoon? The other hookahs that are in the market owe their design to the Mamoon hookah. It has set the tone for the way hookahs must be manufactured in Egypt. It is made of stainless steel in its whole composition- supported by brass rings that ascend toward the upper region of the stem- just above the insertion port for the pipes. The hookah pipes are angled at 69 degrees with the KM(Khalil Mamoon) initials branded on them- they are ideal for an easy draw when you are smoking. The hoses sit gloriously on the stem that supports the steel tray which has brought so many wonderful experiences for people worldwide. The finish is as pure a representation of Egyptian craftsmanship as its avid workers, the weld lines that run through the exterior are the testament of handmade perfection. Adding character to the already beautiful design- which absolutely needs no extra help outshining its counterparts. Continue to read, now we come to, review the top 5 Khalil Mamoon hookahs in 2019. Now you have a pretty clear picture of this brand. We’ve tried to explain everything about this traditional hookahs. Now you know what is KM, what is so special about it and you learned how to recognize authentic Khalil Mamoon hookah so it’s almost impossible to choose a fake. We’ve also given you a list of top 5 best Khalil Mamoon hookahs in 2019 with the pros and cons of each one of it. If you Think that we missed something out, please let us know. If you’ll have a benefit from this article please share it. We invite you to join our hookah community, where we will share tips, tricks and everything from beginners to advanced hookah smoker and definitely have a great time. What are your experiences with Khalil Mamoon?